The new Mobile Ticket service is available on 96% of the city’s public transportation network and is set to be expanded to up to nine more cities across Russia this year. MTS, Russia’s largest telecommunications operator, has launched an NFC service that lets customers in the city of Novosibirsk buy public transport tickets using their mobile phone. The service could be expanded to several additional cities across Russia by the end of the year, MTS says. The ‘Mobile Ticket’ service has been developed in conjunction with payment services company Zolotaya Korona, which runs the E-Pass electronic travel system. In Novosibirsk, 96% of the city’s public transport vehicles, including buses, trains and trams, are equipped to support E-Pass, enabling customers to purchase tickets with Zolotaya Korona’s existing transport card. Now, the city’s public transportation users can purchase their tickets on any of these 1,070 vehicles in the city using their mobile phones. To use the service, MTS subscribers who have an NFC phone first need to replace their existing SIM card with one that supports the ‘Mobile Ticket’ service. Replacement SIMs are available from MTS stores free of charge. Customers then deposit money into a dedicated prepaid Mobile Ticket account with MTS and funds are deducted from that account each time they tap their phone to a ticketing machine. MTS subscribers with standard mobile phones can also use the service by obtaining an NFC antenna add-on at any MTS store for a fee of 10 Rubles (US$0.32). They will also get a replacement SIM card which supports the service free of charge. Public transportation users who are not currently MTS subscribers can also make use of the service. Those with an NFC phone are required to pay 150 rubles (US$4.77) for a new SIM card while those with standard mobile phones will also have to buy the NFC add-on. “Our transportation card is successfully operating in ten regions of Russia, and we plan to replicate the Mobile Ticket service in all of these regions,” says Zolotaya Korona’s Alexander Grishin. “We hope that the technical solution developed in conjunction with Zolotaya Korona for the project in Novosibirsk will be the basis for the introduction of similar scale transport projects in other Russian cities,” says Dmitriy Panfilov, director of MTS’ financial services department. “At the end of 2013, we will launch a similar project in several cities. I am sure that it will take several years, but payments from a mobile phone to access transport will become as commonplace as it is today with the electronic payment cards”. 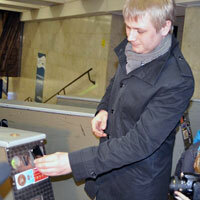 Last year, MTS launched an NFC payments service in Moscow. The company is currently reported to be in discussion with fellow carriers Vimpelcom and MegaFon with a view to forming an NFC joint venture.